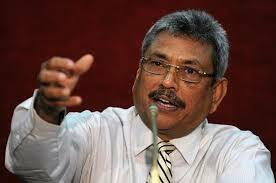 Former Defence Secretary Gotabaya Rajapaksa yesterday said that the government will take prompt decisions only if it is going to put a Rajapaksa family member behind bars. “Apart from that nobody in the government takes decisions. This is why this country is not moving forward as it was under the previous government,” he said,. The country gained massive development under the rule of former President Mahinda Rajapaksa as he gave full freedom to the government servants to take decisions. The former Defence Secretary was speaking at the inauguration of Viyathmaga professional association in Anuradhapura yesterday. He said that former President Rajapaksa took decisions at right time without any fear and such decisions led to end the scourge of terrorism that had been devastating the country for more than 30 years.